Adrianne Palicki (Jess) was interviewed this week. Kathryn Newton (Claire Novak) was in the news this week. In the wake of the Harvey Weinstein revelations two of our alumni spoke out.
.@JensenAckles talks to @ PIX11 about his work on ‘Supernatural' and more. We have now had both Jared and Jensen give interviews on major outlets. See Jared on The Jimmy Kimmel Show here and Jensen on Kelly and Ryan here. The restricted, official trailer for Kathryn Newton's project The Blockers is now available. Ed's fellow Ghostbuster Travis Wester (Harry Spangler) appeared on NCIS giving Fansided The Supernatural crossover we never knew we wanted. See the preview for David Hayden-Jones's (Mr. Ketch) The Bramble House. 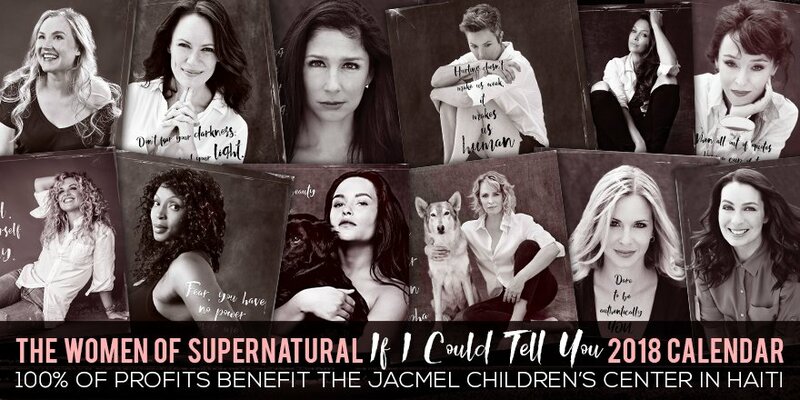 This limited edition calendar features the lovely ladies of Supernatural: Rachel Miner (Meg #2), Ruth Connell (Rowena), Kim Rhodes (Jody Mills), Briana Buckmaster (Donna Hanscomb), Felicia Day Charlie Bradbury), Shoshannah Stern (Eileen Leahy), Emily Swallow (Amara), Alaina Huffman (Abbadon), Katherine Ramdeen (Alex), Samantha Smith (Mary Winchester), Lisa Berry (Billie the Reaper), and Amy Gumenick (Young Mary Winchester).